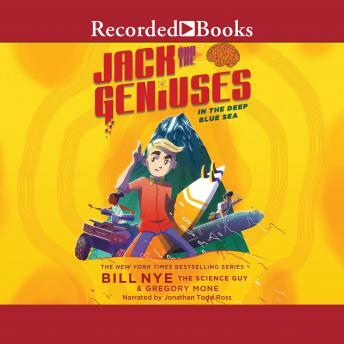 Bill Nye continues the thrilling and scientific adventures of the Jack and the Geniuses series New York Times-bestselling authors Bill Nye the Science Guy and Gregory Mone take middle-grade readers on a scientific adventure in Book 2 of the exciting new Jack and the Geniuses series. The series combines real-world science along with a mysterious adventure that will leave kids guessing until the end, making the books ideal for STEM education. In the second installment, In the Deep Blue Sea, Jack, his genius siblings Ava and Matt, and inventor Dr. Hank Witherspoon travel to the Hawaiian island home of Ashley Hawking, a technology billionaire. Hawking and engineer Rosa Morris have built a revolutionary electricity plant that harvests energy from the deep ocean, but someone has been sabotaging the project. In their search for the culprit, Jack and crew navigate an unusual world of characters and suspects, including Hawking and her obnoxiously intelligent son, Steven; a family of surfers who accuse the billionaire of trespassing on sacred land; an ex-Navy SEAL with a fondness for cat photos; and a cigar-chomping man who calls himself the Air-Conditioning King of Hawaii. Readers will learn about the mysteries of the deep ocean, the scientific process, and the potential of green energy as Jack and his brilliant siblings use all their brainpower to survive. Integrating real science facts with humor and suspense and featuring a multiethnic cast of boy and girl characters, this engaging series is an irresistible combination for middle-grade readers. With easy-to-read language presented in a fun and accessible way, these books are great for both inquisitive kids and reluctant readers. In the Deep Blue Sea: Jack and the Geniuses Book 2 includes information about the science discussed and used to solve the mystery, as well as a cool project that kids can do at home or in the classroom.